At brokerage Kotak Securities, analysts estimate unsold inventory held by a group of leading Mumbai developers alone now stands at some Rs.53,400 crore—with an additional Rs.36,800 crore of project launches in the pipeline. 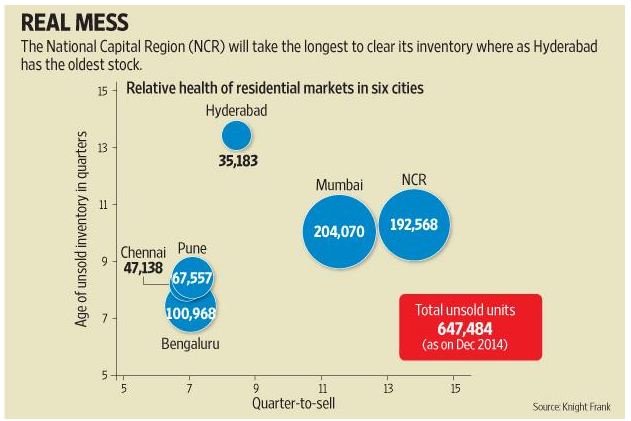 That puts the current, unsold area in Mumbai at almost the value of the total sold in the 2014 calendar year. The backlog, analysts estimate, could take more than a decade to clear... It now takes developers about four-and-a-half years to turn property inventory into cash, more than a full year longer than it takes developers in China, according to Thomson Reuters Starmine data. Another article points to a study by Knight Frank India which highlights the large volumes of inventory piled up across the largest cities. For example, in Delhi, even if no more properties are added to the market, the current inventory will take about 14 quarters to be sold.